Disclaimer: I did not pay for my meal, I dined with co-owner David Mackintosh who is also a friend. The opinions reported below are based solely on my thoughts at the time of my visit. I was running late. I’m not used to catching the train, but I didn’t like my chances driving into Melbourne CBD and parking in a laneway off a laneway. I ascended the escalators at Parliament Station, my quadriceps twanging as I skipped every second step. I shuffled briskly down Bourke Street and took a right at Liverpool, which practically turns into Punch Lane. I could feel the warmth in my cheeks as I crossed Flinders Lane, passed Longrain, and walked straight past my destination. Luckily, the blur of someone waving caught my attention through arched windows, and I entered Rosa’s Kitchen. “Sorry I’m late”, I mumbled as the rustic simplicity of the room prompted me to relax. It was the same feeling you experience after a long day at work, when head directly to your bedroom (do not pass go) and face-plant, defeated, onto the bed. 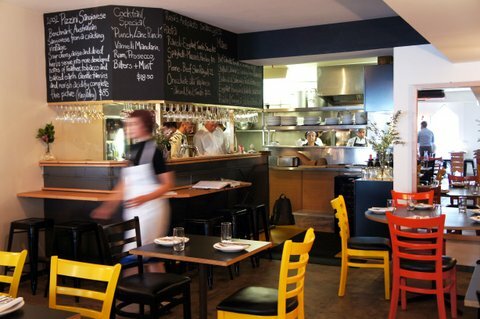 Rosa’s Kitchen, a new Italian restaurant by Rosa Mitchell (ex-Journal Canteen, Hobson’s Bay Hotel), David Mackintosh and Peter Bartholomew (both MoVida Group, Pei Modern and Coda), has moved in where Lucattini’s sat aging for over 20 years. The team got their hands dirty chipping away at plaster to reveal suffocated brick, and ripping up blue carpet that probably made women partial to doilies and floral wallpaper cringe. The amiably dated ‘cucina’ and ‘Italiana’ neon lettering remain outside. 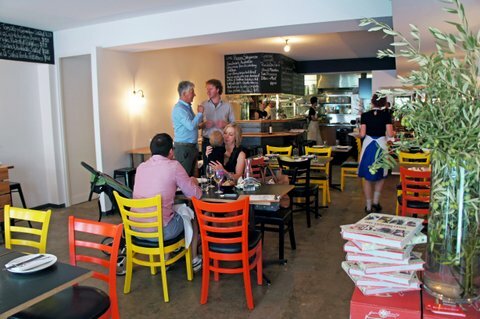 Inside, red and yellow chairs beg diners to loosen up, backed up by the informality of a menu scribbled in chalk on blackboards around the room. Rosa brings to her kitchen—and your mouth—homely, Sicilian food. Hospitality workers are already taking advantage of the late night bar menu (calling it a 'bar menu' doesn't really do it justice), but we started with a small antipasto platter. 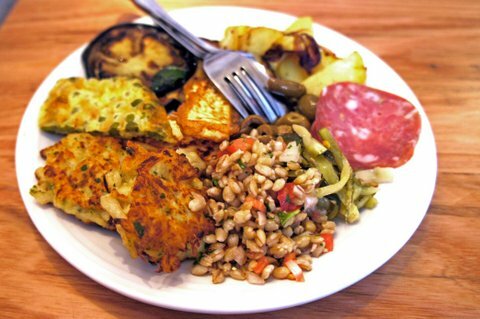 An unassuming white plate arrived overflowing with crisp pea and cauliflower fritters, a barley salad with shards of tomato, pork salami spiked with fennel, silky grilled eggplant, firm fried chunks of ricotta, and other morsels that transported you to an Italian farmhouse in the hills. We shared ravioli, a nostalgic favourite I used to order with my father on weekends. To this day the dish is referred to as ‘square noo-noos’ in my family. This entrée version featured six squares of perfectly seasoned pasta with eggplant in an acidic tomato sugo. At the table beside us, a gorgeous child with barely enough teeth for solids was demanding more penne with beef shin ragyu. Although the stuffed calamari with garlicky beans was tempting as a main, we opted for something less traditional. Or perhaps more traditional, depending on whether you were born in Melbourne or Sicily. 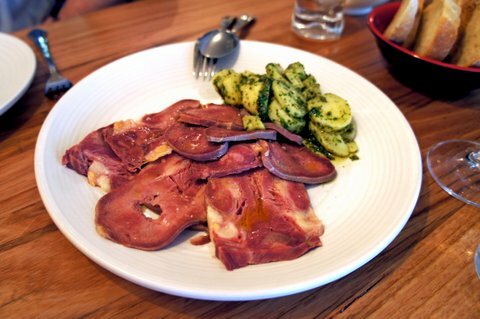 Poached tongue definitely isn’t everyone’s first choice, but if you were blindfolded and fork-fed a lightly salted slice of hearty, regional cooking, you’d leave your mouth open for more. The bite-sized potatoes served with a shock of salsa verde also balanced the fatty sinews of the tongue. As our waitress approached, we remorsefully begged her to understand how full we were from the generous portion sizes, and please don’t be offended that we couldn’t finish it all. “Would you like to order some dessert?” she countered. We ordered two. Rosa’s classic Italian desserts give meaning to the word ‘homemade’. 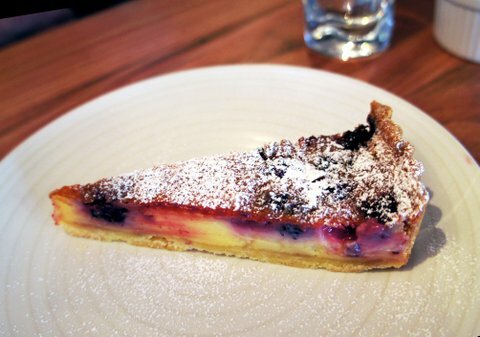 A velvety slice of short-crust boysenberry and custard tart was spotted with purple stains, plucked from Rosa’s farm near Yandoit. Similarly, the lemon custard (courtesy of lemons from Rosa’s garden) in the Zuppa Inglase was so smooth it can only be described as seductive. 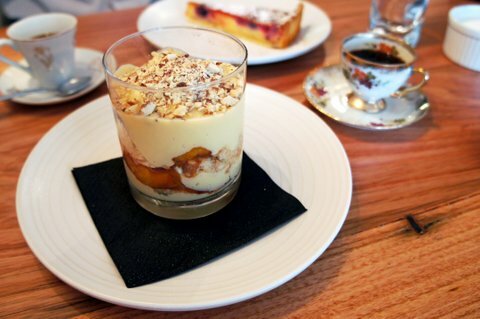 Layered in glass with almond crumble and dense, homemade brioche soaked in Amaretto, every mouthful was a pleasure. Coffee at Rosa’s Kitchen is made Italian style only. You won’t find fussy pour-overs and drip-drops here; just thick, stovetop caffeine the way nonna used to make it. The wine list isn’t bad, either. Assembled by sommelier and maitre d’, Lazlo Evenhuis (ex-The Crimean), it’s mostly loyal to Italy, with a generous handful of grapes from Sicily. As for Rosa, she’s a walking smile in a bandana headband. When I visited she split her time between the kitchen—alongside head chef Lucy David (ex-Coda and Pei Modern) and Braedan Cleave (ex-Rosetta)—and as front of house, greeting the lunch trade and taking pictures of her new baby on an iPad. The menu at Rosa’s Kitchen rotates every couple of weeks, depending on what ingredients are seasonal. And although restaurants in Melbourne throw around phrases such as “local produce” and “farm-sourced”, Rosa’s Kitchen practices what they preach. You can taste the freshness in Rosa’s food, and most mains are under $30. It’s a small price to pay for the taste of Italian passion and a dining experience that feels like a big hug. I love your description of the food being like a big hug - that's how I felt about Rosa's as well! Thanks Cara! Hopefully everyone gets that feeling from the atmosphere at Rosa's. Such a gorgeous little place. IT IS the same Rosa's that used to be above Journal! I haven't been going because I thought this new one is an impostor but it's not! Oh wow, have to go there pronto, i was devastated when I discovered the old one had gone. Rosa is one of my favourite restaurants. They have a friendly staff as well.